The Roo Garden Apron Has Arrived! | Faddegon's Nursery, Inc. The Roo Garden Apron Has Arrived! Mar 18, 2016 | What's New? 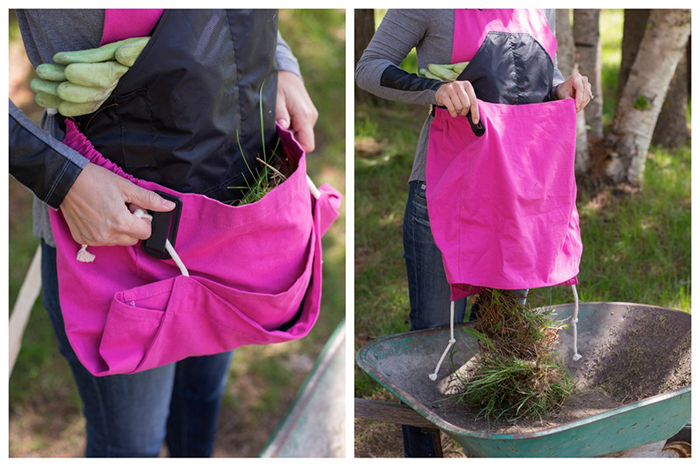 Have you heard about The Roo Gardening Apron? I am so excited about this great garden tool! I got mine and was an immediate fan. I am one of those people who has had any number of buckets, tubs and pots out in the yard, so I always have something to toss the weeds into. But…no matter how organized I am at the beginning of the day, I always end up with a mess. I feel like The Roo was made for me! For deadheading and weeding: I can’t think of anything better. Spent flowers move with me, all the way to the compost, right in my apron. When done, I just unbuckle the pouch and empty it out. I even keep my trowel in the pouch. When I’m finished working, I can just hose out the pouch if I need to! For vegetable gardening: You can’t beat The Roo for gathering. How many times have you used your shirt to bring some edibles to the kitchen? Too many times, I bet. Take a look at this great video and then get your Roo today! In four great colors! Peacock Blue, Purple Orchid, Leaf Green or Pink Peony. Adjustable cotton straps fit any size in comfort and are designed to fit over the shoulders rather than the neck to provide all day comfort.